I would sign a prenup. I believe that marriage is about a bond. This country makes us do it a certain way, so we have to play by the rules. Most of us would get married without the paper work if we could. But, a prenup is about protection and i do not think there is anything wrong with protecting yourself in a country with high divorce rates! I’m kinda on the fence with this one because for me it does show a lack of trust. But then again the party that has the most to lose should also protect their interest now shouldn’t they? I would sign a prenup though just to prove the bond and love I have for my partner. I find the more others are talking about pre-nups and I am more informed, the concept is not quite as intimidating. In regards to pros and cons, I can see both sides as favorable. For those who view it as a security binding document which may not ever need legitimatization, I can understand their perspective. I can also see others point of view of feeling a sense of a lack of trust. I believe both parties should mutually come to a consensus in efforts to avoid problems later. I would as soon not get married than sign a pre-nup. For me, that is planning the divorce before the marriage. Someone who wants to do that that is going into the marriage with one foot kotching the door for the way out. I’m an all in or nothing girl. Surely marriage is about love not money and assets. If that were a consideration for a marriage then I would most likely not enter into it. Marriage is a coming together of love and not a business transaction. But then I maybe called naive. I would sign one and would hope that my partner would sign one. As someone who was married and is divorced I think you go in with all the hopes and beliefs that your marriage won’t fail and signing a pre-nup that protects both partners allows you to try and work on your marriage instead of running for the hills. Thanks so much for sharing your views on this topic. Thanks for sharing your past experience(divorce) i’m sure it is a reason why many are For prenuptial agreements. Yep, my 20’s were one thing and my 40’s another. People have to do what feels right to them. 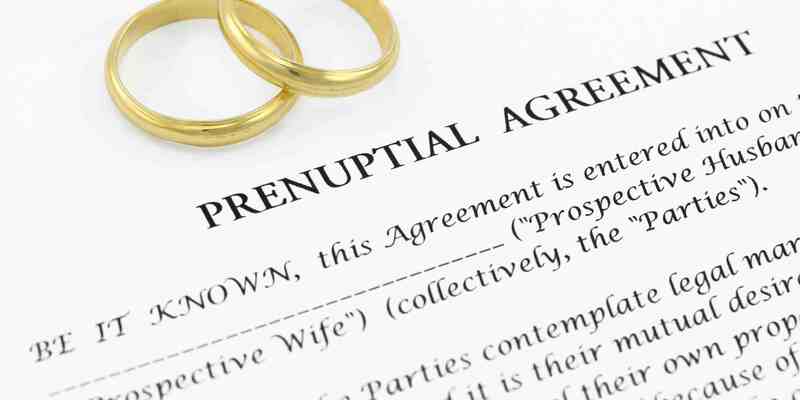 Ahh, I used to be the person that would never sign a pre-nup, but looking at some of the things that have gone on in my own family surrounding finances and marriages/divorces – a pre-nup would make life a whole lot easier. Just so everyone knows what they are entitled too – ending a relationship is stress enough in itself! Sorry for the late reply firstly, and thanks so much for stopping by girl. I appreciate you sharing from personal experience so often we can have a paticular mind set which can be changed when situations happen around us, as it helps us to see another view point in this case why a pre-nup would just make life easier and how it could be used to avoid any nonsense that could occur in the case of a divorce. Growing up in a single parent family, I never had a chance to see what a successful or even successful marriage looked like. A lot of my friends were also in a single parent families and those whose parents were together were in unhappy relationships. As I was growing up, I was constantly questioning whether love and happy and long lasting marriages existed. I think a lot of people can probably relate, so when you find yourself ready to marry, you may still have those doubts about marriage in your subconscious. However, marriage in my opinion is about allowing yourself to be vulnerable to the person that you love. If you don’t have that trust, then maybe you’re not ready to marry or that person is not right for you. A prenup for me is like setting yourself up for failure, it makes me feel like you believe that divorce is inevitable. I do understand the reasoning of a prenup and I can’t lie, I am a bit on the fence with this, but for me marriage is a life commitment. I never want to get divorced, but who does? I’m sure many have gone into marriage with my view that divorce is a huge no-no, but then found themselves in a situation where they felt like it was their only option. I would say that it is highly unlikely that I would sign a prenup, but I won’t know for definite till I am actually in this situation.